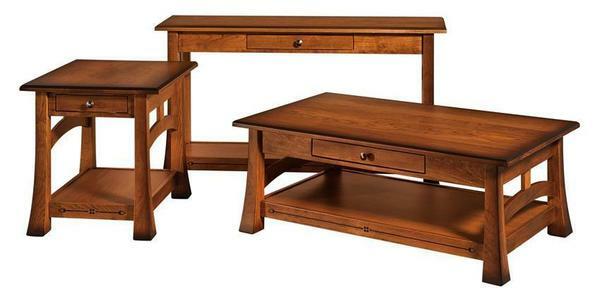 If bungalow mission is your style, you will love out Amish Brady Sofa Table. The mission style design really showcases the skill of our Amish woodworkers with arching details throughout. This sofa table includes a 1-inch thick top, inset soft-close drawer, tapered legs connected by bungalow-style arch details, an open shelf base with dyed tupelo inlays. Customize this mission marvel by selecting the wood type, finish, and hardware that match the vision for your home. Shown in cherry with FC-N3176 Malguania stain with burnishings, #10 sheen, and #51 hardware.